Get a free keg with the purchase of a kegerator at MoreBeer! MoreBeer.com Coupon Code Description: If you have been thinking about picking up a new homebrew kegerator, now is the perfect time. From now until 2/22/2019 you can get a FREE 5 Gallon Ball Lock Keg with the purchase of any More Beer kegerators. Plus get Fast & Free Shipping! These kegerators were developed by homebrewers for homebrewers and offer a very unique set of features at a price that cannot be beat. For starters they are made with home brewers in mind so the digital controller goes from 26°F all the way up to 82°F to allow for fermentation control as well as serving. The kegerators also have a stainless door, stainless steel floor, CO2 tank holder, tower fan, tap & faucet tool, hose clamps, castor wheels, a glass storage rack and a drip tray. Coupon Code Description: This MoreBeer.com promo code will save you 10% on Intertap draft beer items including their top of the line stainless steel beer faucets and draft beer towers! Intertap stainless steel beer faucets combine all the benefits of forward sealing faucets but with best in class reliability and functionality. Most standard beer faucets use a rear sealing design where the beer that is left in the faucet after being shut off must drain through a vent hole creating opportunity for bacteria and yeast to reproduce. Intertap’s seal at the front helps prevent that from happening in your beer faucet! Click the following link to see all of the Intertap items that qualify for this More Beer promo code! Plus get free More Beer shipping on any order over $59! Coupon Description: There has been a price drop on the RoboBrew home brewing system and you can now pick one up for just $472 at Williams Homebrewing. 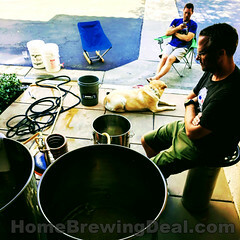 Turnkey home brewing systems have been all of the rage over the last couple years as manufactures have been coming up with clever ways of simplifying all grain home brewing and shrinking the footprint of home breweries. Keg King has now entered the market place with their Robo Bbrew digital home brewing system. While the name may be less than desirable, they certainly got the functionality right for their home beer brewing system. For the price, it is difficult to find a better home brewing setup. 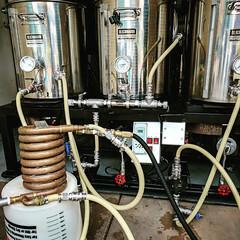 The Robo Brew homebrewing system includes a pump for wort recirculation with an on off switch, as well as a false bottom and grain pipe to both protect the pump from clogging, and hold the crushed grain above the bottom for good wort circulation. That is a big feature upgrade when compared to lower cost home brewing systems. The Robo Brew holds 9 gallons which makes it the perfect size for 5 gallon batches of your favorite home brewed beer. The grain basket will hold up to 18 pounds of crushed malt and grains! I real plus is the Robo Brew runs on a 110 volt plug, so you do not need a 220 v to power it unlike some electric home brewing systems; you also do not need to worry about running out of propane during your brew day since it is a fully electric home brewing system. 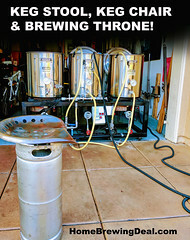 The Keg King ROBOBREW is like a simplified Grain Father home brewing setup. The Robobrew has a basic electronic thermostat that lets you set temperature and relax while the Robobrew electric home brewing system handles your mash conversion for you. Heck, you can even program the RoboBrew home brewing in advance! The RoboBrew includes just about everything that you need to start brewing right out the box and it is built from almost entirely stainless steel! In fact the Robobrew even includes a stainless steel immersion wort chiller with standard 1/2″ hose barb outlets! The Robo Brew home brewing system also includes a Digital Backlit Temperature Control, Malt Pipe, Dual Element Heating, a stainless steel ball valve and Magnetic Pump! With all of this, the RoboBrew is one of the best home brewing deals out there for just $472. William’s Home Brewing Grain Mill Motorizing Kit! Coupon Description: Do you want to super charge your home brewing grain mill? Well William’s Brewing has a new product that you are going to love. Their new homebrewing grain mill motorizing kit features a high torque grain mill motor fits the 10mm diameter shaft of most standard home brewing grain mills, including their L07 and B21 homebrew mills and many other other two or three roller mills with 1½” diameter rollers and with a 10mm diameter drive shaft. Over the past 4 months or so I have been trying hard to find a good solution for keeping the solids and hop matter created during the boil, out of my homebrewing fermenter. I started out using a Blichmann hop blocker, which worked fine, but I was a little disappointed with the quantity of wort that I had to leave behind in the kettle. 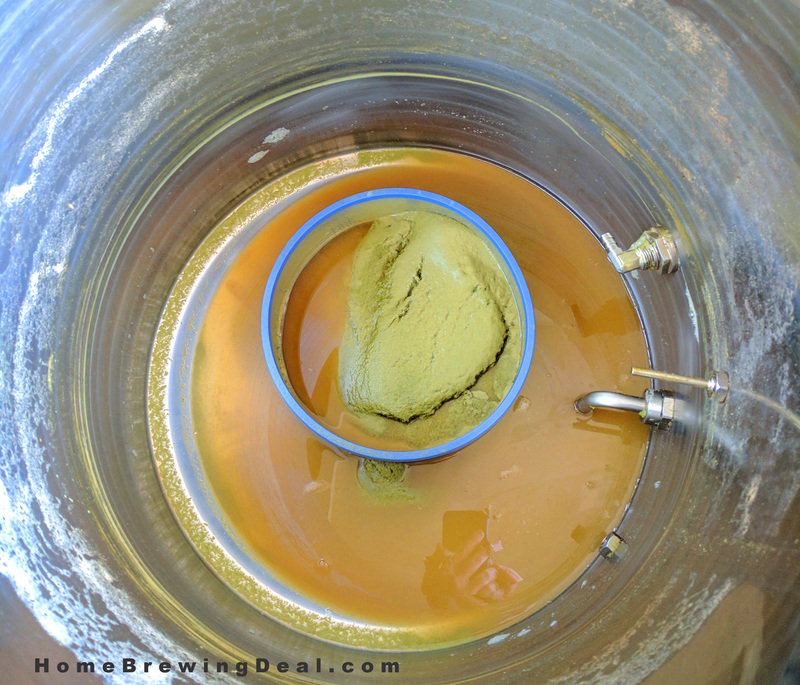 I then switched over to a hop spider / stainless steel hop filter which worked terrible as I was plagued with clogging issues. I then used 2 stainless steel hop filters with worked better but I still had major concerns regarding diminished hop utilization. Now I have found myself going down a new path and trying the Trub Trapper. The reason I purchased the Trub Trapper was because on paper it looks like the perfect solution for my needs and works well with my all grain configuration. What I like about the design of the trub trapper is that it has no top or bottom, so the hops can circulate in the kettle and I do not have to worry about reduced bitterness and aroma from stagnated hop circulation. It has a low profile so even if it gets clogged, there wont be too much of a wort loss and most importantly the trub is supposed to be caught in the trub trapper during the whirlpool so I do not transfer it to my conical fermenter. So how does the trub trapper work in reality? Per the description of the trub trapper, it is intended for a 10 – 15 gallon home brewing kettle and they do offer a smaller version for 5 gallon kettles. I use a 20 gallon Blichmann home brewing kettle, but for the most part only brew 5 and 10 gallon batches, so I figured, what the hell, I will give it a shot with my setup. My initial concern once I received the trub trapper was that it might be too small for my brewing setup but I figured I would give it a test run anyhow. For my test brew, I went with a 5 gallon batch of MoreBeer’s M-80 All Grain IPA home brewing recipe. I figured the 6 oz’s of hops would be a good test of the Trub Trappers capabilities. Prior to brew day I started off by giving the TrubTrapper a good cleaning, like I do with any newly purchased home brewing equipment. The design of the Trub Trapper is relatively basic. It looks like an old school air filter but instead of a paper membrane in the center, it has a ring of drilled stainless steel surrounded by a layer stainless steel mesh. On the top and bottom of the Trub Trapper there is a silicon seal. Prior to starting my boil, I placed the trub tapper in the center of my boil kettle as shown in the following photo. Something important to keep in mind, the TrubTrapper is only going to be effective if you have the capability of conducting a whirlpool at the end of your boil. 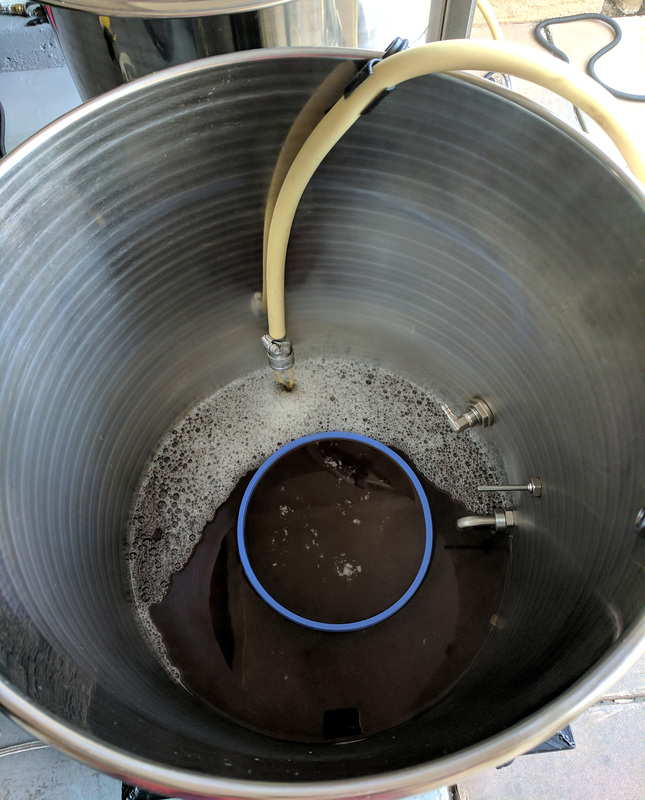 Whirlpooling is a brewing process where after your boil has completed, you recirculate your wort inside your kettle with the use of a pump and whirlpool arm. 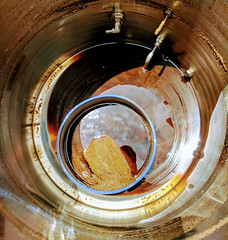 As the wort swirls around your boil kettle, the trub trapper catches and contains it. If you do not have a whirlpool arm in your kettle, you can easily add one yourself as I did. A whirlpool arm will run you about $38 and you can find a great home brewing whirlpool arm here if needed. 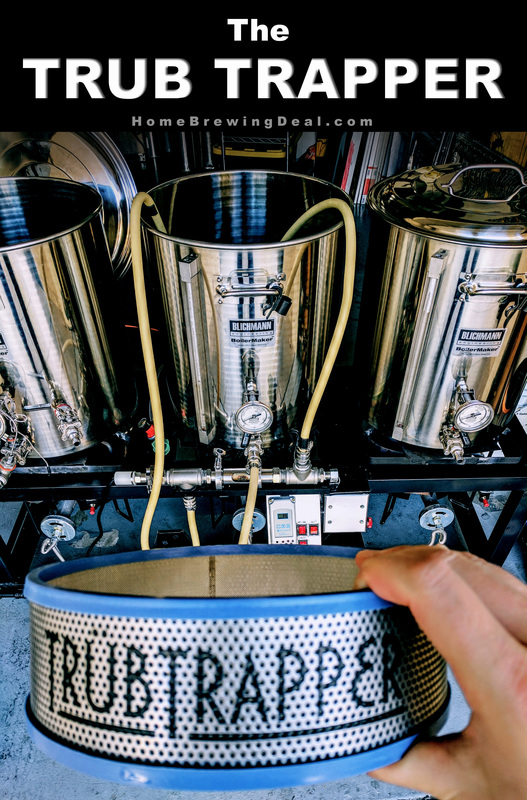 This animated homebrewing gif shows the whirlpooling process being conducted. For the trub trapper to be most effective, you need to allow the wort to whirlpool for about 10-15 minutes. Depending on your homebrew recipe, this could be a great time for a hop addition or to begin your wort chilling process which is what I did. All in my whirlpool process lasted about 20 minutes before my wort had chilled down to 70 F and I began transferring it to my conical fermenter. So did the Trub Trapper work? You bet your sparge arm it did! The TrubTrapper exceeded my expectations. As you can see from the photo above, it did a fantastic job of capturing the trub and keeping it away from my kettle transfer tube. Initially it clogged a little bit, but I learned that if i burped the far side of it, the seal permitted the caught wort to escape while the Trub Trapper still contained the thick trub sludge. For $50 I feel that it was a great buy, especially when considering that alternative solutions cost far more and are not nearly as effective. If you are considering buying a TrubTrapper, you can get it for a great deal here and it ships free if your order exceeds $59!